Title says it all, really. 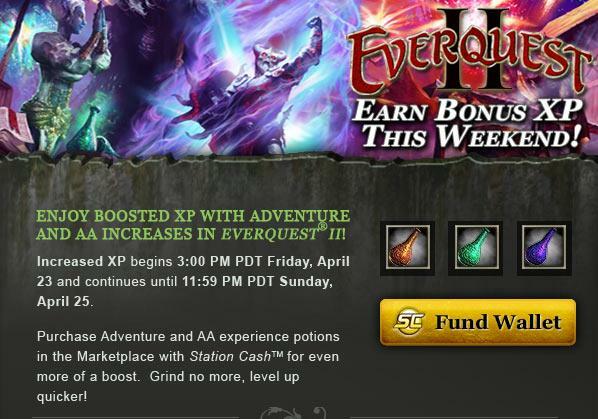 If you play EQ2 and you adventure, you’ll be getting more xp from Friday (today) 3PM Pacific to Sunday 11:59PM. I’m not linking to the wallet thingy – find your own! No mention is made of crafting xp and although I want to say that usually bonus xp weekends include crafting, I won’t, because this would be the time I’d be wrong. I’ll be able to confirm later on today when it kicks off. I have a crafter or two, don’tcha know. Until April 35th!?! That’s a long weekend! Behold! The magic of editing!